I am late to the party, but better late than never. 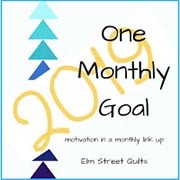 I participated in the Virtual Quilts first challenge to use Electric Quilt 8 to play with a block. The result of that challenge is here. Challenge #2 was to select one of my virtual designs and add Christmas colors. I chose the Alpine Cross from this blog post to play with. * You can also find the Alpine Cross by clicking on the Quilt Blocks tab above my header. There are more designs there for inspiration. Thanks for the fun, Judy! This entry was posted in Playing with Design in Electric Quilt and tagged Alpine Cross, block design, Electric Quilt, EQ8, LCsCottage, Virtual Challenge, Virtual Quilts. Bookmark the permalink. What an amazing difference! You would have to look twice at two real quilts hanging side by side to make sure they were exactly the same design! Wow! I really like that in Christmas colors. That would be a fun challenge, although I wouldn’t have the time now. I’ll have to add it to the list and go back to it later.